Camo’s one of those prints – like leopard or stripes – that will 100% guaranteed never go out of style. With its (obvious) origins in military garb, the camouflage print has made its way into the highest echelons of fashion, only to emerge as a street-style staple – as cool and modern-feeling in 2017 as it was in 1997. In addition to the fact that it elevates any look from basic to badass, the other thing that makes camo so great is that you can treat it like a neutral. Yes, it often features colors other than black, white, and navy (from army green to hot pink), but it’s still, ultimately, a classic – and that means you can mix and match it with other colors and prints that you might not otherwise think to try. 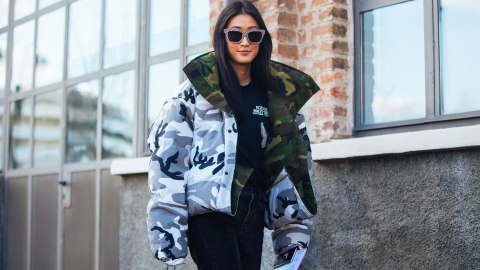 Whether you pair a camo jacket with a dress and heels for a laid-back girly look or with a band tee and leather jeans for an edgier vibe, scroll through the images below for serious camo inspiration. This article was written by Kristen Bousquet from StyleCaster and was legally licensed through the NewsCred publisher network. Please direct all licensing questions to legal@newscred.com.